The Return of the Reich? 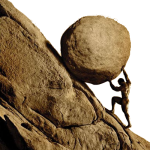 This is my second follow-up post to The Belief Matrix, in which I attempted to advance a universal model for civilizational responses to subsistence crises (The Malthusian Loop) and the Western challenge (The Sisyphean Loop). This time I will look at Germany, a nation that was always torn between its hard-assimilated Roman / Western identity, and German Romanticism – the nativist reaction against the “Idea of the West” (as previously loosely-defined, a set of concepts like the scientific method, rule of law, economic rationalism, and liberalism). Before World War One, Germany was a confident, expanding power, but one wracked by insecurity. It was encircled by France and Russia on land, and contained by Great Britain at sea. The increasing cooperation between those three nations reinforced Germany’s suspicions and made it resentful about being denied its rightful place in the sun (all the best colonies had already been snapped up by the time Germany came to the imperialist game). In retrospect, much has been made of the balefulness of the Prussian militarist tradition, the influence of German nationalist groups, and the Kaiser’s bombastic antebellum rhetoric as one of the enabling factors of Germany’s Sonderweg. However, one should also note that in 1900 Germans enjoyed a higher level of adult enfranchisement than the British (22% versus 18% of the population, albeit with the caveat that the Reichstag’s powers were far more circumscribed) and that the anti-war Social Democrats won 34.8% in 1912. Almost every major German figure bears within himself both sides of this contrast. That is why German thinkers and bards talk more of “two souls in one breast” than do the thinkers of any national culture. . . . They treat their souls as a fond mother treats an enfant terrible: scolding yet egging on. That may make them “geniuses” and “daemonic,” but this inner conflict over the Roman wall is not always so harmless. Sometimes it is psychologically accompanied by projection, fanaticism, hysteria, instability, delusions of persecution plus persecution of others, and convulsive outbursts of physical violence. Romanticism is Germanic and reached its purest expression in those territories which are freest from Roman colonization. Everything that is regarded as an essential aspect of the romantic spirit, irrationalism, the mystic welding together of subject and object, the tendency to intermingle the arts, the longing for the far-away and the strange, the feeling for the infinite and the continuity of historic development. There are many more interesting musing on the Teutonic character, particularly in his thesis that the “schizoid polarity in German minds” is not inconsistent with the “German craving for discipline, authority, ruthless order”, since “the excessive and traditional discipline by the German state” is but the “the direct product of the excessive lack of inner discipline of the individual German”, that is, of “their intoxication with chaos, their Faustian romanticism”. Above is the application of the Belief Matrix model to German history in the 20th C. Note the changes / improvement of terms from the previous model. On the horizontal axis, the Acceptance (of tradition) was replaced by Sobornost – a catch-all term for a deep sense of internal peace and unity between races, religions, sexes, etc, within a society, or in the words of Russian philosopher Nikolai Lossky, “the combination of freedom and unity of many persons on the basis of their common love for the same absolute values”. A good example of such a society would be the 1950’s-1960’s United States, when inequality was (relatively) low, people left the keys in their car doors and there were (as yet) few hippies / feminists / commies / etc to disturb the peace. Its opposite, formerly Rejection (of tradition), is Poshlost, which according to different commentators is “petty evil or self-satisfied vulgarity”, “triviality, vulgarity, sexual promiscuity, and a lack of spirituality”, “not only the obviously trashy but mainly the falsely important, the falsely beautiful, the falsely clever, the falsely attractive”, and “corny trash, vulgar clichés, Philistinism in all its phases, imitations of imitations, bogus profundities, crude, moronic and dishonest pseudo-literature”. This is again a good catch-all term for categorizing declining cultures that had lost their belief in themselves, such as Weimar Germany or 1990’s Russia. 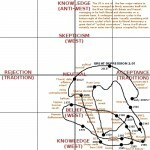 On the vertical axis, I replaced the vague Belief in the West / Anti-West (vague because the “Idea of the West”, which is what I meant by using the “West” in this context in previous posts, is not altogether synonymous with specific “Western” countries such as France or the US) with Rationalism (“The Idea of the West” / liberalism / Mediterranean / Greco-Roman civilization / Enlightenment ideal, – NOT necessarily democracy, which in Aristotle’s original conception is the tyranny of the many, and is if anything closer to sobornost than to rationalism – i.e., democracy is perpendicular to liberalism, the two being rather difficult to reconcile) and Romanticism (“irrationalism, the mystic welding together of subject and object, the tendency to intermingle the arts, the longing for the far-away and the strange, the feeling for the infinite and the continuity of historic development”, the sublime, etc – much like postmodernism, it is very hard to define, for definition is contrary to its very spirit). After the failure of the Spring Offensive in 1918 and the introduction of fresh, well-equipped American troops, backed by the world’s first industrial power, Germany’s surrender was probably inevitable; by the end of the year, its home front in collapse. The enemy blockade had cut off vital imports such as phosphates for agriculture, fuelled massive inflation (ersatz substitutes could no longer cope) and stirred social discontent… Nationalists would reinterpret the German request for an armistice in November 1918 as a perfidious “stab in the back” by Jews, socialists and civilian politicians – the so-called “November criminals”, and this myth would later contribute to the rise of Hitler. This was part of the general post-war disillusionment. Gloomy poems and art… war cripples; veterans unable to adjust to civilian life; socialist agitation and right-wing reaction; Spengler’s The Decline of the West; the feeling that it was all for nothing: these are some of the things characterizing the post-war period.In Germany, the once-high fertility rate fell by half within just a decade from 1914 to the 1920’s; until then, a uniquely rapid demographic transition. The Treaty of Versailles and resulting political turmoil pushed Germans into the top-left part of the Belief Matrix – the Region of Disillusionment. Yet the lack of belief that characterizes the Region of Disillusionment makes it profoundly unstable. The tortured souls caught up in there cannot resist the Romantic seduction of a Great March back to the right of the Belief Matrix, back to sobornost, to save themselves from their “inner mental and emotional anarchy”. Mein Kampf was a bestseller long before the German people, voting uncoerced in the free Reichstag election of September 1930, increased the Nazi seats from 12 to 107 and made them the biggest party in Germany. By then, Hitler had said in Mein Kampf (to pick a typical threat at random): “If at the start [of World War I] we had held under poison gas twelve or fifteen thousand of these Hebrew subverters of our people… then the sacrifice of a million Germans at the front would not have been in vain. 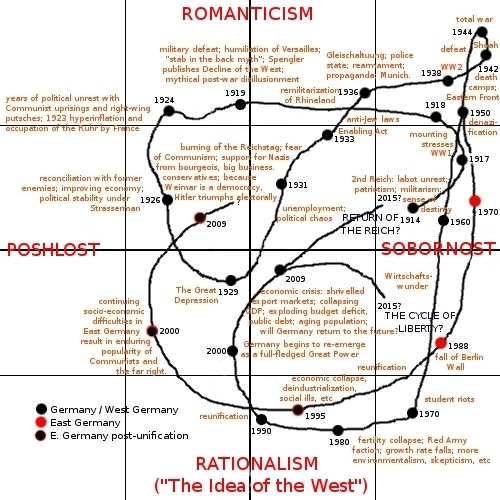 One undeniable achievement of the Nazis was that they restored a sense of self-belief to the German people, but one based on racialist fanaticism on the top-right of the belief matrix, where Romantic mysticism is wedded to sobornost. 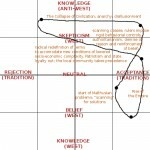 In the top-right of the Belief Matrix, despotisms arise. Painfully, over eons, civilization stamps its traditional and conservative values on men. Only within these values, or traffic lights, are freedom and objective justice possible. One by one Hitler efficiently smashes the traffic lights of the “common basis of humanity”. With them, freedom and objective justice effectively vanish in Germany. Nazism scorns personal freedom and objectivity and all universal, unnational values as being the “superficial” civilization of the sunny Mediterranean, in contrast with the “deeper” Kultur of northern fogs, that misty metapolitics, that “queer mixture of mysticism and brutality”. From Rumor and Reflection, Bernard Berenson – written in February 1942. Nazism is an attempt on the part of Germany to Asiatize itself completely, destroying and eradicating everything in itself that spells Europe, which Europe is equivalent to Mediterranean. It began with the easiest to accomplish, the wholesale massacre of the Jews, always the spearhead of Mediterranean civilization. National Socialism has understood how to take the soulless framework of technology and fill it with the rhythm and hot impulses of our time. As a geopolitical power in its own right, much like the German states after the Treaty of Westphalia in 1648 – Germany ceased to matter as a sovereign Great Power. During the 1950’s-1970’s, denazification and the re-imposition of rationalism (liberal democracy in the West, socialist democracy in the East) plunged Germany to the bottom-right, the only area on the belief matrix where liberal democracy can effectively thrive in the long-term, kept inside by the centripetal forces of liberty cycles. Both halves found a new prosperity. In the West, there was a Wirtschaftswunder, enabled by the Marshall Plan, economic deregulation, cheap energy and the possibility of rapid convergence to US / British levels of GDP per capita because of the wartime destruction of its industrial base. The return to sobornost, which the Nazis made possible, ironically reinforced Germany’s ultimate reconciliation with rationalism. 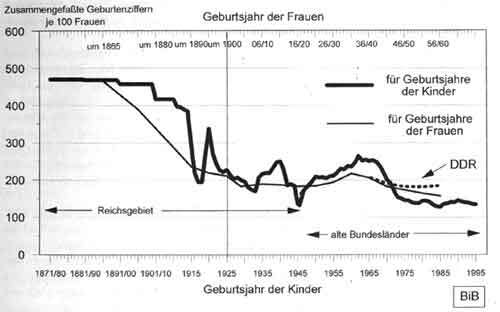 [German historical TFR (total fertility rate) on thick line – since children could be considered a rough indicator of confidence in its future, demography may offer an insight into the state of a society’s belief in itself. The beginning of the drop from the 1890’s is a natural fertility transition due to urbanization and greater female literacy, but the post-WW1 drop is unprecedentedly rapid and corresponds to a period of poshlost. It recovered somewhat during prewar Nazism and postwar democracy, before plunging again from the late 1960’s to sub-replacement level rates – where they remain to this date]. However, the situation in West Germany changed radically from the late 1960’s (see Belief Matrix graph) as economic growth slowed, fertility began to decline rapidly and there appeared new concerns like environmentalism and German historical guilt re-the Holocaust. West Germans began to move to the left on the Belief Matrix, losing faith in their nation. This transition took longer to begin in East Germany, but after the collapse of socialism in the late 1980’s, the sense of disillusionment there was vastly greater, as its newly-discovered freedoms were accompanied by demographic collapse, deindustrialization and disrespect from the “Besser-Wessis”. Despite the limitations on political and civil rights under the GDR, significant numbers of East Germans believe life under was it better – and pine for the return of the sobornost it ultimately represented [my emphasis]. … “From today’s perspective, I believe that we were driven out of paradise when the Wall came down,” one person writes, and a 38-year-old man “thanks God” that he was able to experience living in the GDR, noting that it wasn’t until after German reunification that he witnessed people who feared for their existence, beggars and homeless people. In other words, belief is necessary for national survival, whereas freedom is tangential. You don’t even have to ask the East Germans, looking at their fertility rates is enough. (And in a sense, that describes pretty much all of Europe. In modern societies, it is not individually rational to have more than one or at most two children. The long-term result, barring a technological silver bullet like artificial wombs or robots, is an accelerating national decline and possibly collapse – or the reversal of the very same rational values that made the demographic collapse possible in the first place. Better hope the reversal will not be an overcompensation, e.g. fascism or religious fundamentalism). Today, Germany is in a strange and unusual position – though it is almost certainly locked into secular decline, it has been unshackled from its long strategic dormancy imposed by the Cold War superpower. Germany has one of the world’s most advanced industrial economies, but is uncomfortably reliant on manufactured exports to provide the savings needed to sustain its welfare state and rapidly aging population. Speaking of which, its fertility rate has fallen to well below replacement level rates of 2.1 children per woman in the early 1970’s – one of the earliest such fertility transitions (and predating Russia’s by 20 years, which is the reason Russia has some chances of recovery in the next few years). Amazingly, every single year since 1972 saw fewer babies born in West Germany than in 1946, just one year after a crushing defeat and military occupation (the equivalent year for East Germany is 1990). Furthermore, Germany is the only place in Europe (with the sole exception of culturally-similar Austria), where even the desired TFR is at a sub-replacement level of 1.8 (real TFR is 1.4). Nor is immigration a solution given the sheer scale of the influx needed to maintain current working-age populations and German xenophobia. Projecting to 2050, it would need annual immigration of 487,000 people just to keep the labor size constant and 810,000 to maintain a 3:1 ratio between workers and retirees. This is politically unrealistic. So bearing in mind that Germans have not been reproducing themselves for a full generation now (and have no desire to start doing so) and the infeasibility of large-scale immigration, this means that Germany’s chances of solving its demographic problems in the foreseeable future are next to zero. Will the world continue to soak up German exports? Probably not as much as before, because of the impending dangers to globalization from peak oil and geopolitical disruptions. (Although one advantage Germany does have is in its strengths in energy efficiency, which constitutes a powerful comparative advantage in a world of soaring energy costs). Even as state revenues drop as the labor force shrinks, welfare demands will increase (e.g. old-age pensions, which already took up 11.8% of the GDP in 2000). The Bundeswehr is of Cold War vintage, designed to fight a traditional Great Power war on the North European Plain, but with as yet minimal power projection capabilities. (Not that Germany, a mostly land-locked nation with a minimal colonial heritage, would even be able to do much with it). France will lock up the immense energy and fertilizer reservoirs of North Africa, and it will not be interested in sharing its (relative) energy and demographic bounties with a weakening Germany. The world’s major maritime powers will joust in a new scramble for Africa; Sweden looks set to regain its old status as the predominant Baltic Power; and there is little point in surmounting the Alps to expand into Italy. Facing a subpar energy future, the loss of export markets in a protectionist world, a rapid demographic decline, and an unprecedented fiscal crisis, Berlin will again look east – as it so often has in the past in times of stress. It is in its strategic interests to draw closer to Moscow, given the mutual desirability of setting up a bilateral relationship based on trading Russian commodities (natural gas) for German machine tools and technology, as occurred so often in the past. (For instance, in the Treaty of Rappallo (1922), the two international pariahs signed a peace agreement, forgave each other’s debts and signed a free trade accord. Russia also helped Germany circumvent the Treaty of Versailles by allowing Germany to use its territory to continue military-related R&D and weapons testing, far from the prying eyes of Western spies). Furthermore, Russia could use a neutral-to-friendly Germany as a shield to consolidate its power in the post-Soviet space. As so often happened in the past, Poland will fall in the way of this Russo-German relationship. Russia is interested in pushing American influence out of East-Central Europe, converting the region into a neutral buffer for its empire. Germany will be interested in furthering its economic penetration of the region, given the losses of some of its other export markets, and in preventively blocking Russia’s further expansion into Europe proper; in addition, there’s also its traditional craving for more Lebensraum. However, Poland will be supported directly by France, which has a direct interest in guaranteeing its sovereignty in order to prevent the rise of a German-dominated Europe (or a contiguous Russo-German bloc, which would amount to the same thing); and despite its likely retreat from Eurasian power politics in the face of mounting domestic problems, the US too will likely contribute to Polish security (preventing the rise of a Eurasian hegemon will still figure amongst Washington’s priorities). Interestingly, Britain will probably try to maintain neutrality and good relations with all sides: its desire to support France and Poland in order to avoid a united European hegemon, will be counterbalanced by its growing energy dependence on Russia. Countries under stress tend to pull together, and that often can mean identifying outsiders in their midst. The German economy has not performed well for 15 years. It is now in its third recession since 2001, unemployment has reached a 73-year high, and beginning in 2006, changes in social welfare laws mean that literally millions of Germans will cease to receive benefits payments. If these realities do spark some kind of social backlash, it could prove significant that Germany hosts Europe’s largest Turkish population and immigrants from a smattering of many other nationalities. There are plenty of outsiders to choose from. Second, Berlin is resuscitating relations with Moscow. Germany is Russia’s largest energy and trade customer, and the Schroeder government has gone to great pains to push that relationship even further. Alone among European and NATO states, Germany has kept mum during the recent goings-on in Ukraine, and it alone is standing aside even as the rest of the West is pursuing a broad geopolitical advance throughout all of Russia’s former provinces. A German-Russian alignment is not only logical in a geopolitical sense, but relations have a long way to grow before hitting any natural constraints. Though the two fought each other bitterly during World War II, it is often forgotten that they cooperated deeply until they actually bordered each other. Right now, there are a dozen countries in the zone of territory between them — broadly the same countries that were there in 1939, when Molotov and Ribbentrop decided to carve out the future. After 60 years in a geopolitical coma, Germany is not just turning a page, it is beginning to write a new book. This in no way means that Germany is doomed to return to its fascist past, but neither is it a foregone conclusion that the Germany of the future will be an American ally, a British ally or especially a French ally (in fact, the past 60 years are the only period in which Paris and Berlin have seen eye-to-eye). Where Germany will evolve is anyone’s guess: For all practical purposes, Berlin is only now waking up. A new balance of power must now be crafted. At present, Germany and Russia are both feeling quite unsettled, and some 21st-century version of the Treaty of Rapallo appears to be in the cards. That does not mean war is inevitable. What is inevitable is change. The least likely result of a major power emerging at the heart of a continent is business as usual. And if history is any guide, Germany’s re-emergence during the next few years will slam into Europe with all the subtlety of, well, the German army. Germany is a spiritually bifurcated and psychologically tortured nation; though it played a major role in manufacturing the Faustian world of machines, rationalism and the intellect, it is safe to say that a nation which produced the likes of Nietzsche, Spengler and Heidegger possesses a profoundly mystical soul, and secretly yearns to return to its past-and-future despite the ostensible comfort of its material surroundings. The imposition of liberalism on its soil was artificial, not organic, and its social effects have been disastrous of late. Furthermore, Germany is now facing an unprecedented set of challenges stemming from its economic malaise, demographic collapse and the imminent global energy crisis. The USSR has retreated, NATO is retreating, and the US itself will soon follow; as the last constraint, the EU looks strong, but at its heart it is nothing more than a paper tiger (a very big one, admittedly) that will likely dissolve in the upheavals ahead, leaving behind only a glorified free trade zone, if that. Germany is now becoming an increasingly free actor in Europe, free to follow its own optimal geopolitical strategy. Although it is now relatively pacifist and militarily weak, but history shows that can metamorphose with unsettling rapidity – just compare the Germany of 1929 with the Germany of 1939. Then as now, momentous change is on its way. This is not to imply that it will become fascist or even abandon its current political system (though those are distinct possibilities), but it will become more a more illiberal, authoritarian and expansionist state. The return of the Reich is nigh.